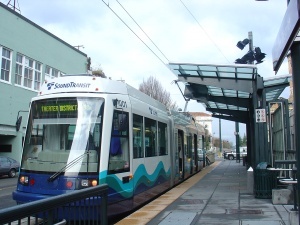 Tacoma Link is a modern streetcar line from Tacoma Dome to Downtown Tacoma. It connects with Sounder trains at Tacoma Dome. Service is provided 7 days a week every 12 minutes on weekdays and Saturdays and every 24 minutes on Sundays. This line does not charge a fare. All rides on the Tacoma Link are free. Bicycles can be taken aboard the light rail at all hours on all cars (up to 4 per car, 2 on each end). Bicyclists must hold on to their bikes. Disabled riders can press the round accessibility symbol on the outside of the vehicle door when the train has stopped. The light rail operator will deploy a ramp.